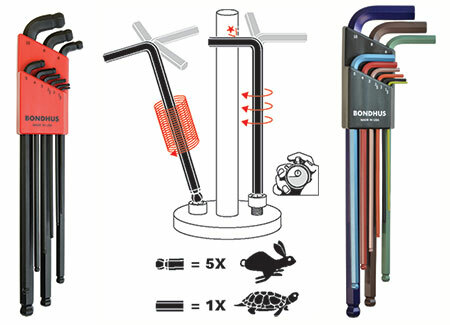 Innovative Clever Tools from Bondhus. Creators of the revolutionary pivot head wrenches and the ingenious New Stubby Double Ball L-Wrenches. Their tool range consists of a huge selection of L-Wrenches with options of sets, multi packs, ProGuard, BriteGuard, GoldGuard, Stubby, TORX, and Pivot. Wing tools, Fold ups, T-Handles, Screw and Nut drivers, Click Sets, Sockets, Blade Bits, Hex Enders, Hex Pro Pivot Head Wrenches plus all the accessories. In 1964, John Bondhus began manufacturing the original “Balldriver®” ball end hex tool which he invented. Since that time, he has taken great pride in being the industry leader in designing and manufacturing innovative, timesaving tools. He has built his business by providing Bondhus customers with the highest quality range of innovative products. Their very active R&D department are continuously designing, upgrading and inventing new clever products and specialist tools, their most recent new winner being the Stubby Double Ball L-Wrenches with Max Torque. This exclusive new Stubby with ball end on the short arm allows access to screw heads located in tight spaces, delivering 50% more torque than the conventional ball ends, it inserts into the screw and works at a 15-degree angle. The standard ball end on longarm inserts into the screws at a 25-degree angle. The long ball end also allows one to work in hard to reach places. “Bondhus are always ahead of the game, taking their tools to a higher level with really clever new tools and unique upgrades, like the ball end L-Wrench units and now the new Stubby,” said Vermont Sales Director Dale Englebrecht. “This is an innovative design giving the retailers and end users a unique tool and solving a very common problem in the industry. Bondhus always seem to be one step ahead when it comes to their tools, always surprising the industry with something new,” said Englebrecht. Other products recently introduced are the ProGuard and BriteGuard Stubby Ball end L-Wrenches, the ColorGuard Ball End L-Wrenches a super cool concept as the size can now be recognized by the colour which is very convenient for the users. With Bondhus one needs to compare the quality and manufacturing, there tools are all made from Protanium high torque steel which allows for them to have sharper corners to generate maximum holding and turning force, which virtually eliminates all stripped screw heads. Users and tool men know what a stripped and damaged screw head can do to down time, safety and general workmanship. This where a quality professional hex tool from Bondhus comes into its own, most tool users will support this, only buy quality. Years of development and research has gone into the design, shape and finish of the ball ends, for their snug perfect fit which can easily be seen if one compares, the clean chamfered machined tip ends on all their tools for the perfect fit to generate greater torque and no slipping. The same applies to the corrosion protection, Bondhus offers a huge range of finishers, colour coded, ProGuard, BriteGuard and GoldGuard a real 14 karat Gold finish. For more information, contact Vermont Sales www.vermontsales.co.za. 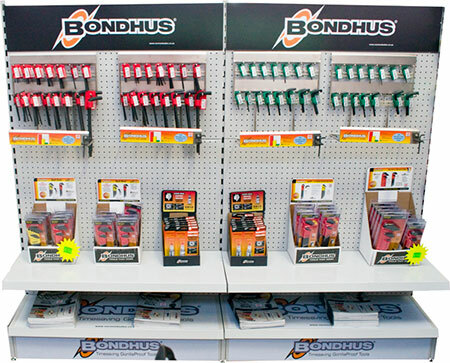 Bondhus products are available from leading outlets countrywide for information on your nearest outlet call Vermont Sales on 011 314 7711.